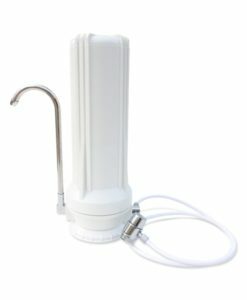 Looking for clean, more healthful drinking water without the hassle of installation or bulky hardware? Then a simple, yet effective countertop water filter system is the right choice. Countertop water filter systems are installed quickly and will make a massive difference to all of your daily drinking needs without the need to hire a plumber or otherwise go out of your way. A countertop water filter system has the advantages of an under sink filtration system, without the fuss of permanent installation. It’s ideal for college dorms or university housing, RVs, office, vacation homes, apartments, and those who rent their homes. Our countertop water filter system has a 0.5 submicron coconut shell solid carbon block water filter which reduces the presence of a wide variety of contaminants in the water. This filter removes lead, parasites (cryptosporidium & giardia), cloudiness (turbidity), sediment, offensive taste and odor, chlorine, chloramine, THMs (trihalomethanes), VOCs (volatile organic chemicals), asbestos, and more. A countertop water filtration system offers a powerful and convenient method to obtain cleaner, clearer, more healthful drinking water. A countertop water filter system from Premiere Sales offers much greater performance than brands such as Aquasana, Multipure Aquadome, Multipure Aquaversa, and New Wave Enviro.